This tapestry "Le Marais" shows a cute French village. The cobblestoned streets and rustic, traditional structures are seen, decorated with flowers. Full of charm, the use of flowers in intimate relation to homes in France is a tradition seen throughout Europe. Little details such as the ever present bicycles, the cafe tables, the traditional shop signs and the romantic balconies are seen in this work. 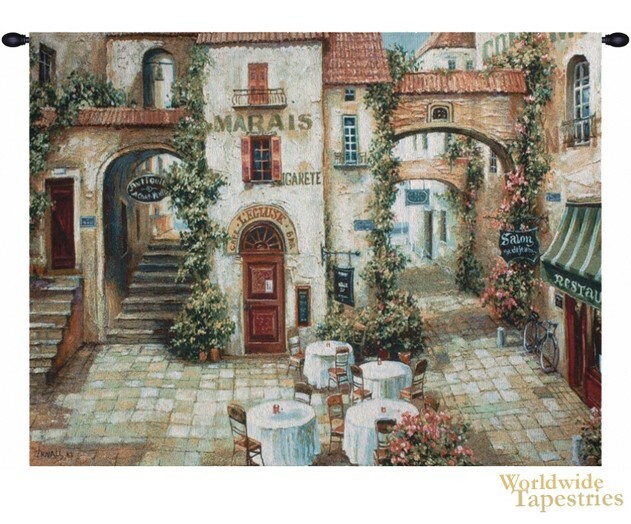 This cityscape tapestry “Le Marais” is lined and has a tunnel for easy hanging. Note: tapestry rods and tassels, where pictured, are not included in the price.